Axions are hypothetical elementary particles that are thought to be among the lightest particles in the universe—about one-quintillionth the size of a proton. These ultralight particles are virtually invisible, yet if they exist, axions and other yet-unobserved particles may make up 80 percent of the material in the universe, in the form of dark matter. In a paper published online in Physical Review Letters, the MIT team proposes an experiment to detect axions by simulating an extreme astrophysical phenomenon known as a magnetar—a type of neutron star that generates an immensely powerful magnetic field. The physicists reasoned that in the presence of an axion such a huge magnetic field should waver ever so slightly, producing a second, vastly smaller magnetic field as a signature of the axion itself. The team consists of MIT associate professor of physics Jesse Thaler, MIT Pappalardo Fellow Benjamin Safdi, and Yonatan Kahn PhD '15, now a postdoc at Princeton University. 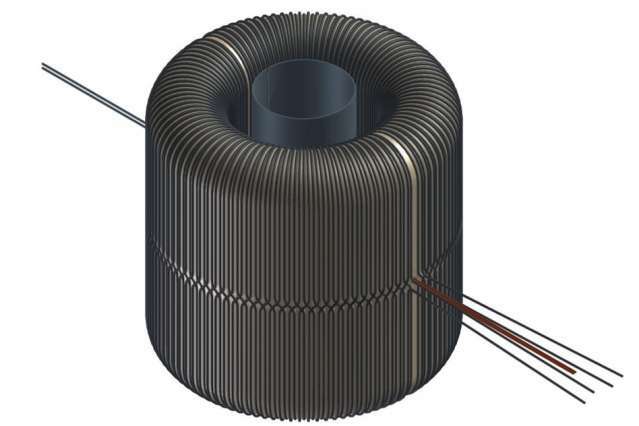 Together, they designed an experiment to recreate the physics of a magnetar in a controlled laboratory environment, using technology borrowed from magnetic resonance imaging (MRI). 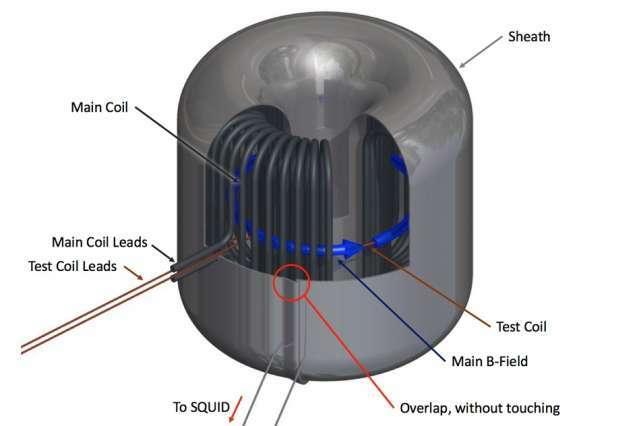 The core of the experiment, which they've named ABRACADABRA (A Broadband/Resonant Approach to Cosmic Axion Detection with an Amplifying B-field Ring Apparatus), consists of a series of magnetic coils, wound in the shape of a toroid, or donut, which is then encased in a layer of superconducting metal and kept in a refrigerator at temperatures just above absolute zero, to minimize external noise. The scientists plan to use a highly sensitive magnetometer, placed inside the donut hole, to detect any signs of axions' influence. "Axions are very strange, counterintuitive particles," Thaler says. "They're extremely light, with feeble interactions, and yet this particle may dominate the matter budget of the universe and be five times more abundant by mass than ordinary matter. So we really had to think hard on whether these particles are in principle detectable using current technology. It's extremely daunting." If they are detected, axions may also explain an outstanding dilemma in particle physics, known as the Strong CP (charge parity) problem: Since the 1970s, scientists have grown increasingly puzzled over what Safdi describes as "the indifference of neutrons to electric fields." Neutrons are elementary particles that are found in the nucleus of almost every atom in matter, and they do not carry a net charge. "We don't expect neutrons to accelerate in the presence of an electric field because they don't carry electric charge, but you might expect them to rotate," Safdi says. "That's because we expect them to have an electric dipole moment, where you can think of a neutron having a plus charge on one side and a minus charge on the other. But from our current understanding, this rotation effect does not exist, whereas theory says it should." Scientists have hypothesized that this bizarre effect may be explained by the axion, which would somehow remove a neutron's electric dipole moment. If so, the axion would modify electric and magnetic phenomena in a way that could be detectable experimentally. "It's very tantalizing to say there might be a particle that serves this deep purpose, and even more so if we were to detect the presence of these particles in the form of dark matter," Thaler says. "The Strong CP problem is associated with whether a neutron's spin responds to electric effects, and you can kind of think of a magnetar as one gigantic spin with big magnetic fields," Thaler explains. "If axions are coming in and changing the properties of nuclear matter to resolve the Strong CP problem, maybe axions can interact with this magnetar and allow you to see it in a new way. So the subtle effects of axions should be amplified." The team's prototype design is surprisingly small—"about the palm of your hand," Safdi says. The researchers, who are theoretical physicists by training, are now working with experimentalists at MIT to build the prototype, which is designed to generate a baseline magnetic field of about 1 tesla, comparable to current MRI machines. If axions are present, that field should waver slightly, producing a very tiny oscillation at a frequency that is directly related to the axion's mass. Using a high-precision magnetometer, Thaler hopes to pick up that frequency and ultimately use it to identify the axion's size. "Only recently have there been many good ideas to search for [low-frequency axions]," says Gray Rybka, an assistant professor of physics at the University of Washington and an ADMX researcher, who was not involved in the research. "The experiment proposed here builds on previous ideas and, if the authors are correct, may be the most practical experimental configuration that can explore some of the plausible lower-frequency axion regimes." "We have an instrument that's sensitive to many wavelengths, and we can tickle it with an axion of one particular wavelength, and ABRACADABRA will resonate," Thaler says. "And we will be going into uncharted territory, where we could possibly see dark matter from this prototype. That would be amazing." One more failure in the attempt to detect what doesn't exist. They haven't tried to detect'em yet. It's just a theoretical proposal. And since they weren't ruled out yet, one can't say they don't exist. ......."if they exist"........What? Wait, in the previous part of the sentence it was imputed these clever little particles do exist but here they are stating "if"? ......Wow, AXIONS are an hypothesis, DARK MATTER is another...........adding two hypotheses together somehow creates a REALITY in the form of what OBSERVED EVIDENCE? The "inferred gravity" hypothesis? So, I'm supposed to look in the mirror every morning & realize that in fact I'm not viewing 80% of the remainder of my body based on three different hypotheses? And why should we give any credence to what you "imply" or the results of your "guessing" without a shred of supporting evidence? P.S. Before you start, there IS supporting evidence for the effect we call DM even if it is not yet considered definitive. .....well then gig, why don't we simply carry out your logic to another obvious & logical conclusion: God has never been detected & is a theoretical proposal. So until such a theoretical proposal can't be ruled out, then one can't say God does not exist & should as the case for Dark Matter be presumed to exist, even though there is no evidence for it (other than inferred gravity?). ......or you for your dimwitted inferred gravitational anomalies. I think jalmy means it's easier to guess than to experiment. So if facts don't matter, guessing is better. To each his/her own, but some of us are more interested in the results (accurate answers) than in minimizing effort. So if facts don't matter, guessing is better. "Team simulates a magnetar to seek dark matter particle"
......sure, like guessing that a "magnetar" can be "simulated" here on planet Earth using that gadget in the pic just beneath the title of the article. why don't we simply carry out your logic to another obvious & logical conclusion: God has never been detected & is a theoretical proposal. Until such a theoretical proposal can't be ruled out, one can't say God does not exist & should as the case for Dark Matter be presumed to exist, even though there is no evidence for it (other than inferred gravity?). Presume nothing. Hypothesize & test. Refine & repeat. All knowledge is provisional but each iteration gets you closer to the truth. No scientist "presumes" dark matter exists. It (with general relativity) is simply the most plausible hypothesis to explain what we observe. It is also why science does not even try to say whether or not God exists. It's implausible to say the least but untestable, so outside the realm of science. If your beliefs are true you have nothing to fear, because science gets closer to the truth with each iteration. What is the "inferred" property of a god? The irony that they name their apparatus ABRACADABRA to search for the magical DM via the other magical phenomenon the magnetar. .......then God & Dark Matter are presently on equal footing with one another? None of the constituents of either have been found, but man-o-man do we ever have the "inferred effects" that both exist? It's sounding a lot like the two are one in the same, only the titles are different & neither can be found. ..........right, but we're actually talking not about "scientist" but rather "asstrophysicist", big difference you know, like the PO resident ones who live here under their internet cover names so they won't be embarrassed with their zany ideas. whether or not God exists. It's implausible to say the least but untestable, so outside the realm of science. I think it is a testable idea and it failed all tests. .....what tests zany zwicky guy? both sides heard the same words. I believe that there is an undiscovered difference in the way the brains of conservatives and liberals are hard wired. Zwicky received a gold medal for helping orphans. ........of an asstrophysicist, just like you. God & Dark Matter are presently on equal footing with one another? None of the constituents of either have been found, but man-o-man do we ever have the "inferred effects" that both exist? It's sounding a lot like the two are one in the same, only the titles are different & neither can be found. Other than everything we see "exists", there is no inferred property of god. Subsequently, only subjective. DM(unexplained gravitational effect), on the other hand, is a repeating, observed physical effect on the universe around us. Do you think getting a gold medal for helping orphans deserves a downvote? Is it you, Satan ? No, tell me it isn't true that you believe in "Satan" who is God's nemesis as I recall? Then you believe in God? Should I upvote you or downvote you for believing in spirit beings? You know this because you have used a gravimeter that measured 80-95% of your body missing an amount of mass that would be the equivalent of an "unexplained gravitational effect" generated by your body? Just imagine what you would look like if only you could see the rest of yourself in a mirror. This comment shows you are incapable of thinking on any scale larger than yourself. Strongly showing off your narcissistic nature. So you don't recognize sarcasm. By the way zany Zwicky was a master of sarcasm. ......better known as his persistent foul mouthed profanity he would so elaborately put on display when he would burst onto his feet in a crowded symposium & start screaming obscenities at real scientists who disagreed with his disproven Tired Light & Dark Matter theories. So you look in a mirror everyday & wished that grandpa Fritz's 80% missing matter theory could work in reverse, but if you'd just get off the potato chips you wouldn't need to be so defensive about your poor self image. DM is really just a placeholder that arises because our current understanding of the universe through theories such as general relativity can't account for galaxy rotation or the amount of gravitational lens. In particular, there needs to be more mass than observed to account for what we see. The dominate theories for DM reconcile this discrepancy by theorizing the existence of particles that interact weakly with the observed matter and our concentrated in a halo around galaxies. This experiment hopes to discover some of these particles. I, however, am much more in favor of DM theories such as MOND or Superfluids that question our theories to reconcile the discrepancies in our observations and theory rather than adding matter. We as a species are limited by our technology and our location (on earth). With better technology and the ability to preform experiments in deep space (away from gravity wells) we will eventually figure it out. Until then, we just have our best guesses. ......... I'm probably the only guy at the whole world, who can see it clearly: the Maxwell theory is violated with quantum mechanics and with existence of photons. You are right! You probably ARE the only guy in the world that sees things this way. For a very good reason...... You are not living in the same world as the rest of us. oh, and before I started reading these comments, I LIKED physics. See here where the dark matter creation is being simulated. ...QED describes everything in terms of photons. I'm confused (no wisecracks please). How can QED describe e/m fields, as I presume it does, if photons carry no electric charge? if photons carry no electric charge? Counterquestion: Ask yourself what would happen if photons did carry a charge. If you were to hold a positively charged object next to (but not in contact with) a negatively charged object the two would start to equalize their charges (a current would start to flow). (I.e. we would not observe charges at all in this universe because they would all have been nullified soon after it came into being). Well I did ask myself what if virtual electron-positron pairs were connected positive to negative in the form of a string. The first virtual electron in the string would be attached to a real positive charge and the last virtual positron in the string would be connected to a real negative charge. We would have a line of force and a current would start to flow as in sunspot flares. Well I did ask myself what if virtual electron-positron pairs were connected positive to negative in the form of a string. We would have a line of force and a current would start to flow. As I noted: when you put two charged objects right next to each other (e.g two capacitor plates in a vacuum) no current flows. So your theory is at odds with observation. Normally the photons don't mediate charge until their energy doesn't exceed the 512 MeV. Above this threshold the particle and antiparticle pairs can be formed. But if we realize, that the origin of charge is in spin, then we should admit, that the materialization of photons could run at much lower energy density, once these photons would get heavily polarized. I think what he's saying is that virtual positron-electron pairs don't start to pass current until they become real particles. I don't think so. Once they start to pass current they may become energized to the point where they become real particles. Hence lightening and the odor of positrons in the residue. Yes but if you break down the vacuum with moisture for example and raise the voltage high enough current will flow. In a vacuum lines of force consisting of virtual positron-electron strings do exist but current doesn't flow until you break down the vacuum and raise the voltage high enough. I learned about that the hard way in electronics lab. no current flows. So your theory is at odds with observation. Yes but if you break down the vacuum with moisture for example and raise the voltage high enough current will flow. But not because of photons. That's a normal electron/ion flow. You get that in every battery. The photons are just the force carriers - not the charge carriers. You can claim this all you want, but it is not observed (it would make the universe a VASTLY different place if it were so). I learned about that the hard way in electronics lab. Then you didn't learn about this thing called "insulation" and dielectrics - where even if you do break the vacuum down'* no charge flows. Again: your theory doesn't fit with any kind of observation. Which makes it trash. I understand charge carriers must be real particles. Real particles don't just come into existence out of nowhere but through the sufficient excitation of virtual particle pairs which I suppose is the function of the photons. You break down the vacuum by creating real particles out of virtual particle pairs. The vacuum naturally contains all kinds of virtual particle pairs at the current temperature of the U. That may be what they mean by a false vacuum. Insulators prevent the connection of virtual particle pairs and any force between charged plates. Conductors of course have existing charge carriers so you don't have to worry about creating real particles. There's no point trying to educate you. Another candidate for the ignore list. OK maybe you scored here. Insulators certainly have no conduction electrons. Also they must block the force-carrying photons. This applies to virtual photons only. Meaning real photons are the charge carriers? I don't buy it. These sorts of phenomena/mechanisms fall under the categories of "superexchange mechanisms" and "displacement currents" in vacuum and material mediums/contexts. For example, slowly but surely, mainstream 'critical mass' discovery/understanding of Plasmonic States of energy-space 'features/processes' in many contexts/mediums (ranging from 'empty' energy-space conditions 'vacuum' to range of materials whether 'normally conductive' or not) is leading them to (I hope) incorporate all those usually-missed complexities/subtleties which connect it all, at all scales. It's only different versions of stupidity. One is obnoxious the other tries to do the impossible while keeping the thieves at bay. You may show a proof for anything when you begin with a false premise. There's no one intelligent enough to show real logic. ... as the world has reached a no turn back point, i.e. a definition of hell with global warming. We should not give PhD's in stupidity, imagine, teaching archaic nonsense as fact, lol. Hey we need you to keep me honest, not educated. Where would we be without you? Published in Nature April 2016: https://www.reddi..._direct/ Results demonstrated, that the canonical and spin momenta, forming the Poynting vector within field theory, manifest themselves very differently in interactions with matter. As long as the Maxwell equations agree perfectly with the measurements, as in this case, I do not see what the excitement is about. Try a gaussian beam moving through an inhomogeneous, media, lens-like? We do that in optics, fiber! Einstein? Curved space? Sun's aura? Extent? Composition? .. easier to bend space! Well, OK.